eDocSync Server can now be connected to a SQL Server DB or an Embedded SQL CE DB. The alert for the “modified but not synchronized documents” which appeared at the bottom right of the screen, has now been added to the left menu tree. 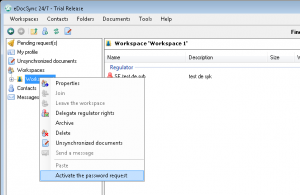 Possibility for the user to activate the password request for each workspace. This option is available only for workspaces that were created with a password. This password will be required after each eDocSync start. For older workspaces and if the user does not recall the password given at its creation, it is always possible to disable again this option. The user is thus sure to always have access to all workspaces. A password manager has been added under the upper menu “Tools”. This password manager will only remember the passwords that have been entered at least once. For example, if a user does not remember the password of an old workspace, the password manager will not be able to recover this password. Automatic backup of the profile of eDocSync during its creation process. Addition of the functionality “Synchronization status” (right click of the mouse on a document or a version of the history). With this functionality you can always know which member did receive the document or not. The chat functionality has been removed. In the previous version of eDocSync, once a document was added into eDocSync, it was still bound to its original location on the hard disk. This means that when the document was modified in eDocSync, the version of the hard disk was automatically updated. This is not the case anymore with this new version: once a document is added into eDocSync, it is completely separated from its original version. This is a copy of its own. Possibility to delete many workspaces at once. All the new documents added within eDocSync are now fully encrypted on the disk. Improvement of the synchronizations and transfers of the documents. When a user is working in a workspace and an invitation to join another workspace happens, he is not “ejected” unexpectedly out of the workspace in which he works. Improvement of the responsiveness of the interface: the screen of the pending requests (workspaces and contacts) is not blinking anymore when there are a lot of pending requests. Better management of the reconnection and disconnection to the Meeting Point. Automatic repair of the CE Database when it is corrupted. The removal of elements from the Clipboard (Clipboard.Clear function of the OS) could induce the crash of the Explorer during the drag & drop of elements from eDocSync towards the Explorer, for example. 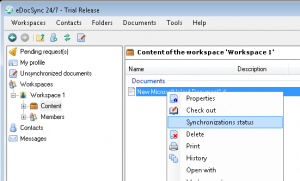 eDocSync can now be installed on a Virtual Machine.